Cancellation: Two calendar weeks prior to check 85%. No-show: 100% of first night's room charge plus taxes. Deposit: A deposit of 10% of the total booking value is due at the time of booking. The Villa La Kola is located in the heart of Krushevo, just off the church of St.John, famous for its frescoes and woodcarvings. The villa features three double rooms (en-suite bathroom with hair-dryer, cable TV, mini bar and a terrace), two 4-bed apartments and four 5-bed apartments, all equipped with kitchen, bathroom with hair-dryer, cable TV, DVD and terraces. The ground floor is the reception and meeting area, also suitable for leisure and socialising.Discount for children :Children up to 7 years - free of charge. Children from 7 to12 years, - 50% discount. Easter vacation only available as a package of 3 days. EXTRA CHARGE for BREAKFAST 2,5 Eur p.p. 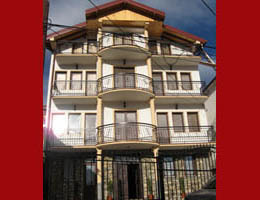 All prices are per room, quoted in EUR including all taxes. 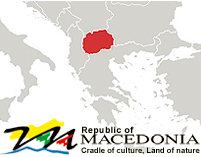 Copyright © 2007 Exploring Macedonia Ltd.